Looks like tonight is the start of the season for many teams the Flyers will face. Davidson, UMass, VCU, St Louis and Rhode Island win. George Mason loses to Penn. Lots of games on ESPN+. Almost too many to follow them all. Good problem to have. The LaSalle loss to Temple was not a surprise and George Mason was only a small favorite over Penn. The GW loss was pretty bad. Yes, they are predicted near the bottom of the A-10, but they were ahead 22-0(!) and still lost at home to an American East Conference team. Shockers were a 10 point favorite coming in. Baylor was a 21.5 point favorite. Duke beating Kentucky by 34. Last edited by UD62; 11-07-2018 at 10:38 PM..
Ohio State over UC at UC yesterday, 64-56, to open UC's renovated arena...hard to beat anybody when you only score 56 points...UC only scored 18 points in the first half. Ohio St. picked mid-pack in B1G, UC picked #2 in AAC. Not good for UC. Sounds like UC either got the jitters or just had a bad night shooting. One guy scored 20 and the rest scored 34 on 22% shooting. Ouch. The Cincinnati Enquirer reporter said that he could say State played great defense, but that is really not what happened. UC suffers from what once plagued the Buckeyes - a team full of great athletes, none of whom can put the ball in the basket! Making it more critical that the Flyers win all the games they should plus a few they aren't. I've been saying that the A10 is further down than people think. Agreed that we need to have a fantastic nc record. We can only drop one or two outside of MSU, Auburn and Butler, and we have to win one of those. This was not a one-off type problem. Lack of offense has been a consistent problem at UC for Cronin's entire tenure. Their defense is good, the offense not so much. 0-2 George Mason was picked to finish 4th in the preseason poll. Embarrassing loss for Richmond to a little school out in the boonies, Farmville, just south of Richmond. Then Mason loses to some unknown neighbor, American. How you lookin' so far A10? Not good, not good. If that’s our conference’s 4th best team this year, then we’re in for a LONG season. Davidson was actually down 76-68 with 3:43 left and finished on an 11-0 run. I did not watch the actual game but was watching the score and play by play on my phone. Davidson was down most of the game. Pulled it out at the very end. Tie score and 4s left. Dartmouth player fouls Grady taking a 3. He makes them all. The GW loss was pretty bad. Yes, they are predicted near the bottom of the A-10, but they were ahead 22-0(!) and still lost at home to an American East Conference team. Stony Brook won @ South Carolina last night. Makes the GW loss look not quite as bad. GW loss was awful. Blew a 22-0 lead. We may win this league yet. SLU beat Troy (the university, not the high school) by 4 AT HOME, LaSalle lost to Lafayette by 1 AT HOME, and Fordham lost at Houston Baptist by 3. On the bright side, there were our Flyers manhandling Coppin State by 30 (in a game that wasn’t that close), St. Weldaventure beating Jackson State by 31, and Duquesne taking care of Bill & Mary by 14. They followed it up with a loss at home to Sienna. Next two are UVA and Michigan. Virtually certain to begin 0-4. The conference is looking pathetic from an early perspective. Checked the box score. They shot 16-34 FTs (47%), and two guys (Nolan & Toro) combined to go 4-16. I don’t thing Sean Finn, Matt Cooper, and Marco Pikaar combined could shoot FTs that badly. Buckeyes pay Fort Wayne today at 4. Purdue Fort Wayne loses to OSU 107-61. Hope the Flyers can do similar this week. Last edited by priceg75; 11-12-2018 at 09:42 AM..
PFW hung with OSU for the first half. So IPFW loses to OSU by 46, but beats Earlham by 61. wow. If I was a team that is supposed to be a high seed in the A10 this season, I wouldn't necessarily call it "fear", but I sure would take note of Obi and what he suddenly adds to almost every aspect of Dayton's play, especially with Josh Cunningham not even in the equation yet. DID I read it right that Buffalo beat Huggy and WVU??? Buffalo blew the Flyers off their home court 5 or 6 years ago. It was ugly. Buffalo beat Arizona in the NCAA Tourney last season by 21 points and returns 6 of their top 7 scorers. They are pretty good. It will be interesting to see what they do against Syracuse and St. Bonaventure. What is the point? Capital is Div III and we beat them by only 18. Looking forward to seeing how Obi plays against Butlers Joey Brunk. Might be the first real test for our freshman stud. Earlham are the quakers, now known as the society of friends. If their opponent scores a basket, they turn the other cheek and let them have the ball back. Comparing Capital to Earlham is like saying Duke and Coppin are both D1. I lived in Hanover and Huntington, and have seen this league play. Harris was coach at Earlham College in Richmond, Indiana for nine seasons, building a record of 175-70 (.714) as he led the Quakers to three Conference (2 Hoosier Collegiate Conf. & 1 Hoosier-Buckeye Collegiate Conf) titles and two Top-12 rankings. His best seasons were 1967–68 when they were ranked 6th in the NAIA final polls with a 25-3 record, making him a finalist for NAIA national coach of the year, and in 1970–71, when the Quakers achieved a record of 24-5. In that year they won the HBCC and reached the National Tournament, losing in the 2nd round. He remains, today, as the Earlham coaching leader in wins and winning percentage. He led the Quakers to 15 conference or tournament titles during his tenure. Earlham is where former UD Football Coach, the late Rick Carter, got his start. There's a classic matchup, DIII Welch could play Earlham with a trophy to the loser. Wisconsin up 13 with 4 minutes to go at X. Looks like UD has a surprisingly decent chance to win the conference. Everyone looks terrible to questionable. Teams in the A10 are going to have a tough time with JC and OBI. The problem is these team sucking now but then playing like gang busters when they play us. Cal Baptist is playing just their second D-I game as a transitional school, ultimately will become a member of the WAC. They hit a nice shot at the buzzer to win this game that you can see below. Always a good day when X loses, especially at home. No sign of party boy Sam Miller at CofC ??? Dukes had miracle comeback to win in OT against awful UIC at home. Is the conference off to a rough start????? We have only one more loss than the Big 12, Big East, Big 10, ACC, & Pac 12...………………………. COMBINED!!!!!! George Mason was up 20 (54-34) at the half and lost by 9. WTF?! Sam Miller transferred to C of C in January 2018. He will be eligible after his transfer redshirt year in January of 2019. Xavier falls to 183 in the Sagarin ratings. Dayton is at 81. A10 currently #19 in the conference rpi rankings with just a 18-14 win/loss record so far. That's the metric I was searching for, but afraid to find it. Really a sad predicament. We tried to help by unloading Coppin State, but alas, no success. An RPI killer. I don't think the A10 is as bad as the record so far indicates, but man what a terrible start for the conference. 19 is pretty bad but I see the Horizon League is #32 at 3-19. Buffalo is ranked #25 in the AP Poll this week. -Being a Big East supporter, with high expectations, and seeing your Conference brethren losing games by large margins to opponents who were your perceived “equals”. I know I’d rather have high expectations and meet them, but this does put an interesting perspective on things. I'd rather be getting beat by good teams, vs getting beat by teams closer to DII talent. 1. What happened to Nova? That is a stunning loss! 2. IUPUI beat an ACC team!!!!!!! 3. Radford upsets Notre Dame!!!!!!! 4. Hoosiers crush Marquette...is Archie getting things in order??? Talk about parity...it is going to be an interesting season, to say the least. St. Joe's blows out Wake Forest in game 1 of the Myrtle Beach (formerly Puerto Rico) invitational. Stanford is 2-1... NC dominated them. -The A10 Tourney will be a dogfight, as teams compete for the only bid that’s likely to come to our Conference. I just checked the conference standings, and there’s a handful of schools that are doing OK so far, record-wise. In addition to Davidson, other undefeated teams include our Flyers, SLU, St. Joe’s, VCU, and Duquesne. 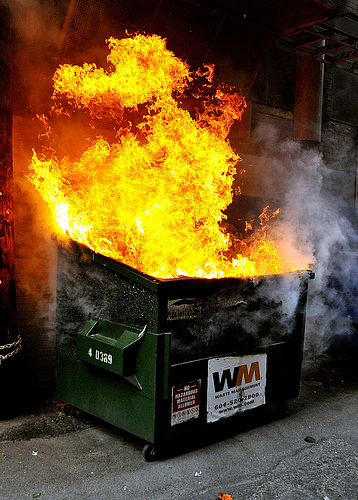 But yes, there are some real dumpster fires at the bottom of the conference, with LaSalle, George Mason, and GW all being winless at this point. A young, hungry and athletic Ohio State team won at Creighton last night and is playing like a true team. With wins at UC and Creighton, they are going to surprise a lot of teams this season. Holtman is a great coach...nobody in C'bus is upset that they lost out on Archie. Brian Gregory is 2-0 on the young season, first time that program has started 2-0 since 2014. Not great competition but still, happy for him. More Big Ten wins, and ACC and Big East losses. Could be a banner year upcoming for the regional P5 schools. Davidson had an odd squeaker over Wichita State 57-- 53. Neither team shot well, except Davidson's stud player threw down 33 points with a bunch coming at the line. And he took over the game by scoring the last 12 points. Their real stud is Grady and he was held to only a few points I think, which is the most impressive part about the win. WSU looks to be in for an usually rough year. Yes, I agree, Holtmann is a great coach. I think that he will produce Matta-like results or better in Columbus. He seems really classy too, very likeable IMO. Last edited by ud2; 11-16-2018 at 12:33 PM..
Crap. We are going in the wrong direction. Down to #22. I expect this to get turned around shortly. with NET, RPI is generally useless (always been useless but used by committee in past so up to now has been useless but important). Advanced metrics are key now, kenpom has A-10 #9 conference behind P-5, BE, AAC, and WCC (Gonzaga, St. Mary's, etc.). Barely ahead of Mountain West and Missouri Valley. Fair enough, I am glad to hear that the A10 is #9 on kenpom. I just went out to my garage and got my crowbar out to open my wallet with and bought a one year subscription to kenpom.com for $19.95. I guess that I will have to get with the program regarding this newfangled, high tech, statistically-advanced NET rating system. But, I still think all of this NET subterfuge is just being used as an excuse to job the non-p5 teams. Last edited by ud2; 11-16-2018 at 06:34 PM..
Last edited by UD62; 11-16-2018 at 10:26 PM.. Right, until IU beats them. Just through some quick browsing of kenpom, there is a lot of information on there that I have never seen elsewhere...looking forward to exploring kenpom further...it is a different way of analyzing college basketball. Last edited by ud2; 11-17-2018 at 01:46 AM.. Please don't become one of those "born-again" statisticians!